So, you have a grading coming up. Time to dust off Nage no Kata, trudge through those 15 techniques, and get that over with. Then you can forget all about it and get back to real judo: randori and shiai. Really, why do you have to spend time on that unrealistic anachronism that has no apparent connection to anything you want to accomplish in your practice? It’s slow and stilted – it can’t possibly have anything to do with the fast pace and excitement of randori and shiai. Nage no Kata might look to you to be just a choreographed exercise in which uke and tori agree, over and over again, to match steps for 2 or 3 paces, at which time tori executes a pretty throw and uke takes a pretty fall. But looks can be deceiving. If you think of the kata as a rote performance of 15 techniques, it will not appear to have much to offer. But looking at it as just a set of stylized techniques is like looking at something from the outside without knowing what is going on inside. You can’t perceive the inner workings of a car, for example, unless you lift up the hood and learn about the systems that make it all work. Maybe you just need a tour guide who will take you inside the kata for a look at some of its less obvious utility for the rest of judo. Let’s start that tour and examine some of the principles underlying the 15 techniques in their specific contexts. We won't be discussing the details of how to do the techniques, but will take an introductory look at some of what is inside the kata that you can take away to improve your judo. When you start a randori or shiai session, there is a lot of ‘noise’ in your judo. Not noise in the auditory sense, but noise in the sense of too many competing stimuli all happening at once. You go out, bow and begin. Right away you have to think about getting an advantageous grip, and preventing your partner from securing his. At the same time, you have to monitor your own balance while trying to disturb his; you have to look for openings, or try to create some for yourself while simultaneously maintaining vigilance for his attacks and his unpredictable moves. This is not the ideal time to be wondering if you’ve learned the fundamentals to all of this: your mental control, posture, stance, understanding of debana (moment of opportunity), power generation and use of tai sabaki (body control) to achieve kuzushi (off-balance) and tsukuri (fitting in), or your ability to read or connect with your partner. You want these things to be integrated into your movement and technique. Awareness of these principles and actions needs to be addressed directly as part of the foundation of your judo if you wish to be able to throw freely with seiryoku zenyo, or best use of energy. The kata strips out all of that noise that comes with randori and shiai. It presents you with some basic situations without the complications of unpredictability that you deal with in free play and contest. The kata highlights and crystallizes important fundamentals. It allows you to study examples of interactions between uke and tori and to examine the underlying principles that govern attack and defense in judo. By providing you with predictable, structured encounters, it gives you the opportunity to recognize these principles more clearly through repeated practice. Techniques are governed by principles, and it is important to be able to grasp and generalize those principles. With all the ‘noise’ gone, you can focus and see what is really happening underneath the techniques. It is like having a zoom lens that brings out what makes this all work. By the same token, uke learns how his attacks can be foiled, and receives continuous lessons in how to handle his body in response to tori's actions. Nage no Kata (along with its counterpart, Katame no Kata) is designated as a Randori noKata. Let’s take a brief look at some of the principles in Nage no Kata and how they can help you fill out your understanding of judo. When Kano created judo, the throwing techniques became the center of the art. Since they involve the most complex movements and issues of coordination and balance, it makes sense that they should form the heart of the system. He also designatedshizentai, or natural posture, as the central stance for judo. (Watson, 2008: 39 - 40) So it is consistent that when you step out in Nage no Kata, bow to joseki and to your partner, that you then step out in shizentai. Kano felt that the principle of shizentai, orshizentai no ri, was important for practical reasons. Shizentai is a relaxed and flexible posture from which to attack or defend without adopting a specific combat kamae, or stance. But there are also philosophical, and by extension, psychological reasons why shizentaino ri is an important principle in the kata. When you step out in shizentai, it is a cue to yourself to leave all conflict and distraction behind. You picture yourself in harmony with all of the forces and energies around you. Your mind is calm, clear, and focused. You are ready to begin. "Remaining mind" or "lingering mind." This is a state of calm alertness or vigilance which is crucial to cultivate in martial arts practice. Zanshin is featured prominently throughout Nage no Kata. As Otaki and Draeger (1983) state, "You certainly realize by now that when you apply a throw in randori or shiai, there is no guarantee that it will score a victory for you. Many a good chance is lost by false assurance or lack of alertness as the opponent slips away from a position on the mat in which he could have been easily overcome. This is due to a lack of zanshin." Ma-ai is the engagement distance for each encounter. It is a dynamic concept, meaning that many factors contribute to the optimal distance for different attacks or defenses. The encounters in Nage no Kata allow you to study changes in engagement distance, something that can shift rapidly in randori or self defense. You may have heard of kiai as a powerful shout uttered during the execution of a technique. However, that is just one expression of kiai. There are no shouts or other vocalizations in Nage no Kata, yet kiai is vital to it. Kiai refers to the expression of spirit and "union of spirit" with your partner. "Your mental attitude must lead your physical actions, setting the stage for your postures and movements, thus conveying a unified dignity of demeanor.You must clearly exhibitcomposure, quiet alertness, and confidence. Your ki [vital energy] and that of your training partner must unite and blend as kiai, which in turn articulates a mental state referred to as muga-mushin." (Otaki and Draeger, 1983: 59) This may sound pretty esoteric for everyday randori, but judo at its highest level - smooth, fluid and apparently effortless - involves overcoming the penchant for confrontation and struggle, and achieving these elements of calmness and unity with your partner's energy and movements. "No self, no mind". This is a concept you should be aware of as something that you may develop at an advanced level of kata or any martial arts practice. It is a state of indifference which frees one from the thought "I am doing this." Jujutsu technicians often equated it tofudo-shin, which translates literally to "immovable mind" and indicates a trained mind which is always at ease and never ruffled or troubled by external occurrences ... It guarantees an always ready mind which can meet any emergency with reasonable assurance of success, and thus it becomes an important development for self defense and sports considerations. (Otaki and Draeger, 1983: 60). This is the governing principle of judo - the best use of energy, or as we often translate it, "maximum efficiency". There are important factors involved in achieving seiryoku zenyo in throwing techniques. In Nage no Kata, tori learns to execute his techniques without exceeding an appropriate amount of force. Kano's vision was that by learning how to achieve the best use of energy in the physical realm of judo, we are better able to grasp it and apply it in the rest of our lives. These are types of combat initiatives. For example, we can think about sen, a direct attack; sen sen no sen, a way of leading uke to do something that we can take advantage of; or gonosen, an initiative that comes after something our partner does. Nage no Kata is almost entirely gonosen (Otaki and Draeger, 1983: 78). We often think of gonosen as "countering" in judo, but it is more than that. In Nage no Kata, tori's gonosen takes the form of "stealing the initiative" from uke; that is, uke begins an attack or approaches with the intent to attack, but tori takes control of the situation with appropriate use of energy and emerges victorious. This is a valuable skill to apply to randori. Riai can be thought of as a synergy between uke and tori. It pervades the kata. Tori is charged with making appropriate responses to uke’s movement or actions. In the riai of the kata, the whole becomes greater than the sum of its parts through the appropriate blending of energies. There are different ways in which we can view this concept. Yielding, or appropriately yielding and redirecting, are apparent in Nage no Kata. This is a fundamental principle for self-defense or sport applications. These are the phases of action that occur in throwing, and include correct tai sabaki, or “body management”. In Nage no Kata, they are examined in techniques in a variety of situations and contexts and are all executed with seiryoku zenyo. The techniques must work realistically and tori must execute them smoothly and powerfully. All techniques in Nage no Kata are practiced on both the right and left sides. This may seem quite basic, but in reality, it tends to be woefully neglected by judoka left to their own devices in everyday practice. There is a lot going on in Nage no Kata, but focusing on two main, interrelated concepts should help you get more out of your kata practice. The first concept is closely tied to the riai of the kata. While it may look like uke and tori are just cooperating in 5 sets of a stylized waltz, each set culminating in tori’s throw, this is not what is happening. In each situation illustrated in Nage no Kata, uke either attacks tori directly, or approaches him with the intent to attack. For example, when uke initiates certain attacks, tori yields and steps back to keep control of his own balance and attempts at the same time to disturb uke’s balance. This causes uke to step forward to maintain his own balance. As they continue stepping, tori steals the initiative from uke’s intent and takes control of the situation. In other cases, tori takes control of the encounter before uke can complete his attack. Some of the differences among the 15 interactions throughout the kata may appear subtle, but it is important to keep in mind that uke changes something each time he re-engages in a new encounter. All of the encounters are examples of attack and defense, or initiation and response. It’s not just a demonstration of a cooperative exercise, beyond the mutual agreement to participate in this formal illustration of judo principles. This leads us to the second of the two important concepts under discussion here: uke changes what he does in the kata, because he is learning. He starts off the kata very confidently pushing tori back, and this results in his being taken over in ukiotoshi. He is still confident as he initiates his second attack, which he has changed to a strike to the top of tori’s head. This also comes to a bad end for uke as he is thrown in seoinage. When he initiates his third attack, he holds back a bit. He has learned to be cautious, and so he braces his front leg slightly, and then offers other resistance as he and tori move through this encounter, which culminates in tori throwing uke with kata guruma. Uke continues to learn and modify his actions throughout the rest of the kata. This is important because tori, in keeping with the riai, responds appropriately to uke’s different attacks or intents throughout the form. If uke’s attacks and approaches were uniform throughout the kata, tori could just respond with the same technique over and over. But uke isn’t stupid! He learns that he can’t approach tori in the same way each time he initiates a new encounter. Tori is adaptable, as he is able to perceive uke’s intent and steal the initiative from him even without an obvious direct attack such as a push or a strike. Each of the five sets of throws in Nage no Kata gives us representative techniques from the five types of throws. While they share underlying principles, some concepts are more evident in certain kinds of throws than in others. Te waza: The hand techniques require good centered action, or you will end up trying to wrestle uke over. Centered action means that you are powering the actions of your arms, hands, legs and feet from the core or center of your body. This is a skill that takes some time to develop. In the Te Waza section of Nage no Kata, you combine centered action with rhythm, balance, extension, and blending or joining with uke’s oncoming energy. Koshi waza: The hip techniques provide lessons in using your retreating action and rotation to draw uke forward as you make your tsukuri. They also feature blending with uke’s energy, and offer examples of changing your stepping pattern to disturb his rhythm and balance. The three specific techniques in the kata chronicle an example of development in judo (Leggett, T.P., 1963: 38), reminding us that judo is a living art that can adapt and change. Ashi waza: The foot and leg techniques highlight the critical elements of rhythm changes that surprise uke, and the importance of timing. We all know what it is like to attempt a foot sweep a bit too early or too late, or to be on the receiving end of a foot sweep that turned into a kick because of poor timing! The techniques in this set also reinforce the need for centered action in powering these throws. Ma sutemi waza: The sutemi waza illustrate the powerful use of your center dropping back and down to draw uke off balance and into a throw. Tori takes advantage of uke’s actions efficiently, by using his whole body weight combined with specific pulling actions. Yoko sutemi waza: All three of the yoko sutemi waza are techniques from the fifth kyo of the Gokyo no waza, or central syllabus of throwing principles. The Gokyo is arranged in five sets from simplest in principle to most complex. Complexity increases from the first kyo to the fifth partly in the number of critical elements involved in techniques and partly through the skills needed to manage these elements with new types of body movements. These movements require increased coordination and different uses of tori's center, among other things. Nage no kata culminates with techniques from this last set of the Gokyo no waza. Kata doesn’t end with the completion of 15 techniques. Each encounter in the kata is a study in principles that can and should be generalized to other situations. Draeger once made the distinction between “doing kata” and “using kata”. Kata is an intrinsic training method of Kodokan Judo, and it has two distinct developmental stages. The first of these is the "doing" stage -- a time when we must study and practice it so that we can gain a mechanical understanding of it. It is a time when we are concerned with each and every technical detail. At this stage, kata is of little training value as a completed training tool; we are simply shaping this tool for later use. After we have a rather good technical basis for kata and can give a rather polished performance of it, then we can put it to use and find answers to technical problems about the various techniques it embodies. This is what can be referred to as the "using" stage. Then and only then will kata become truly useful. you should begin to “use” the kata, in Draeger’s words, to inform the rest of your judo. Each technique in Nage no Kata is a representative model whose principles have much wider applications. Study the principles that make the techniques and situations work and expand your study to other throws that operate on similar actions. Take these principles from ukiotoshi, for example: centered action, rhythm, balance and extension. Study them in variants of ukiotoshi or other te waza such as taiotoshi. Set them up with combinations or as counters. Focus on the underlying principles that govern what happens in each part of the kata. Start adding some ‘noise’ back into your technique application as you try these throws out in randori, but now grounded on principles that you understand and can identify and articulate. Why can’t you just practice these techniques, or others, and think about all the principles that have been mentioned here while you’re practicing them? Surely this formal kata isn’t really necessary to be able to learn these things. Judo has three main areas of concentration: kata, randori and shiai. Kata is clearly not the only way to learn principles in judo. We should be learning in all three areas. But kata provides a structured and clear exposition of principles. While you learn strategies and principles in randori and in preparing for shiai, these tend to be focused on outcome-specific objectives and goals. 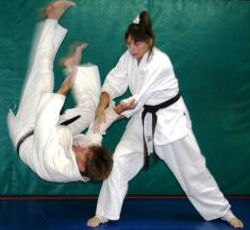 Randori by nature is unstructured, or at least less structured than kata. The lessons that we take from randori are valuable because they are based on a wide variety of experiences – including both successes and failures. But the lack of whole-system instruction and correction it offers needs to be supplemented with a consistent frame of reference to fill out the larger picture of judo, and this is something that kata helps provide. There is a larger problem for the system as a whole that results from engaging in only a randori type of practice. Without other safeguards, the erosion of the knowledge base of the art begins to occur. Judo is a carefully designed, integrated system of physical, mental and philosophical principles. One of the functions of the kata is to preserve that cohesive integration so that it can be transmitted to students over the years. As judo is also a very dynamic art, it lends itself to innovation. Kano was an innovator from the start. But innovation must be based on deep and clear understanding of the core principles of the art. Changes must be in accordance with these principles, or the system begins to morph into something else. We have seen influences from wrestling, sambo, and other grappling arts creep into judo in the competitive arena. These influences are sometimes quite good, and other times highly detrimental. But they are often adopted into judo rather randomly by individuals based on their preferences or inclinations without regard for the internal consistency of the art. When judo becomes jacket wrestling, it has lost elements of its essence, and has begun to move away from its own foundation. Shu ha ri is a method of both preservation and change in Japanese martial art. (Shimabukuro, M., 2008: 59-60). Through shu ha ri, the principles that define a system are carried forward into whatever changes are made over the years. Jones and Hanon (2010) mention Toshiro Daigo's explanation (2008) of the concept of shu ha ri as a framework for the study of kata itself. As one studies kata, there is a progression from mastering basic technical details (shu), to expansion of the grasp and discovery of wider applications of principles (ha), to a culminating understanding and freedom of expression (ri). As judo overall has moved increasingly into sport mode over the years, there is little oversight to changes to it as an art in the way there might have been under the governance of something like shu ha ri. The "official" changes to judo today are largely related to changes in the rules of shiai. Kata helps to preserve underlying principles regardless of shifting trends in how people view or practice judo. Judo has something special. Kata helps us remember who we are despite the increasing pressure to focus on winning competitions above all else, and the encroachment of hype from mixed martial arts or other combat entertainment forms. Now that you’ve taken this little tour inside the kata, perhaps you have found something useful. There is much more to kata than what we have touched on here, but by studying and using some of the principles of Nage no Kata, you will build your judo from the inside out, beginning with mental discipline, stance, centered movement, tai sabaki, power generation, appropriate actions, and more. Nage no Kata distills judo down to the fundamental principles of attack and defense, both physical and mental. You build your techniques on that foundation, and begin to throw with seiryoku zenyo, not brute force. That is what’s special about judo. Aida, H. and Harrison. E.J., trans. (1956). Kodokan Judo. London: W. Foulsham & Co. Ltd.
Draeger, D. (1966). Judo Randori and Ju no Kata. AAU-JBBF Judo Handbook. Jones, L. (2012). Kodokan Judo, in Asian Martial Arts: Constructive thoughts and practical applications. Santa Fe: Via Media Publishing. Jones, L. and Hanon, M. (2010). The Way of Kata in Kodokan Judo. Journal of Asian Martial Arts, 19(4), 22. Kano, J. (1986). Kodokan Judo. Tokyo: Kodansha International Ltd.
Kano, J., and Murata, N. (2005). Mind Over Muscle: Writings from the Founder of Judo. Tokyo: Kodansha International Ltd.
Koizumi, G. (1960). My Study of Judo. New York: Cornerstone Library. Kotani, S., Osawa Y., and Hirose Y. (1968). Kata of Kodokan Judo Revised. Kobe: Koyano Bussan Kaisha, Ltd. Ishikawa,T., and Draeger, D. (1999). Judo Training Methods. Boston: Tuttle Publishing. Leggett, T.P., and Kano, J. (1982). Kata Judo. London: W. Foulsham & Co. Ltd.
Otaki, T. and Draeger, D. (1983). Judo Formal Techniques. Vermont: Charles E. Tuttle Company, Inc.
Shimabukuro, M., and Pellman, L. (2008). Flashing Steel: Mastering Eishin-Ryu Swordsmanship, 2nd edition. Blue Snake Books. Watson, B. (2008). Judo Memoirs of Jigoro Kano. Victoria, BC: Trafford Publishing. Yiannakis, L. (2011). A Taxonomy of Principles Used in Judo Throwing Techniques. Journal of Asian Martial Arts, 20(3). Yiannakis, L. with Cunningham, S. (2003). The Dynamic Nature of Kata. American Judo Magazine, A Journalof the United States Judo Association, A two-part series in Summer 2002 and Fall 2003. Also in Judo Forum Magazine, Vol. 1, Issue 3, December 1998.